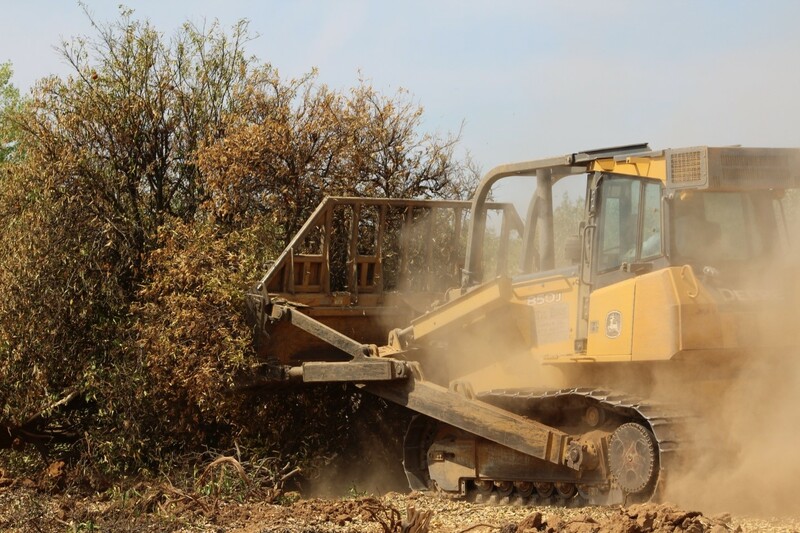 A bulldozer pushes over orange trees already dying because of a lack of water on Harlan Ranch in the International Water District northeast of Clovis. It is the latest of many such cheerless removals of permanent crops on Friant Division farms this year that have resulted from the zero supply of Central Valley Project allocated to Friant users by the Bureau of Reclamation. Harlan Ranch has pushed over 400 acres of trees out of 1,200 acres total. It was a sad sight that has been repeated over and over this summer through the normally lush 1.2 million acre Friant Division, home of the nation’s most vital and productive citrus region. Orange trees, dying for lack of water and wilting in the final moments of their lives, are pushed into tangled heaps of dried limbs before a bulldozer’s blade. Few such scenes have been so well witnessed as the one that played out July 29 on the Harlan Ranch, northeast of Clovis in the International Water District, one of the 31 Friant Division contractors of federal Central Valley Project supplies that for the first time ever are struggling with a zero water allocation from the U.S. Bureau of Reclamation. A news conference, featuring four California Legislature members, took place with calls by those speaking for immediate passage of a rewritten and carefully slimmed-down November ballot water bond measure that includes continuous appropriation for new surface storage and adequately provides for the state’s water needs. Already scheduled to be before voters in November is a larger water bond enacted in 2009 but twice removed by lawmakers from the ballot. The news conference’s backdrop included rows of 30-year-old orange trees on their last legs because there has been no water for their irrigation. As the news conference was taking place, those trees were being pushed over. Grower Shawn Stevenson has removed 400 acres of permanent crops from the 1,200-acre Harlan Ranch. Another 150 acres of trees are receiving just enough water to keep them alive. 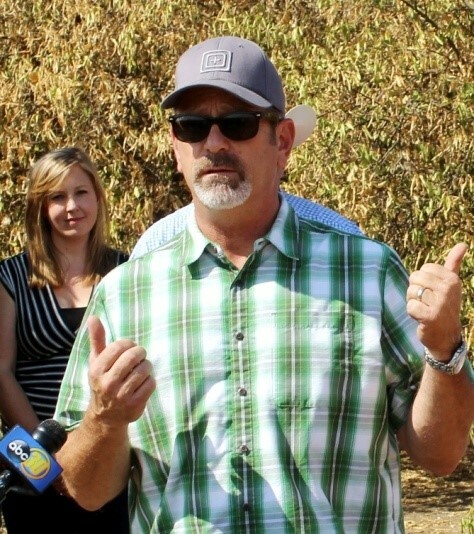 Stevenson, like thousands of other valley growers, is relying on groundwater plus a small amount of unused San Joaquin River Restoration water he was able to secure. Trees still in production are receiving only two-thirds of normal supplies. Some 30% of Stevenson’s employees have lost their jobs. The situation is as bad or even worse in several other Friant districts. Exeter-based California Citrus Mutual, which represents orange and other citrus growers throughout the valley, arranged the well attended news conference. Four Republican lawmakers spoke. All focused on efforts to rewrite the water bond. That would have to be successfully completed and enacted in early August or the larger 2009 measure will go before voters. The speakers included Assembly Minority Leader Connie Conway of Tulare, Assembly Members Jim Patterson of Fresno and Frank Bigelow of O’Neals (MADERA COUNTY), and state Senator Tom Berryhill of Twain Harte (TUOLUMNE COUNTY). Conway said she now regrets that the $11.14 billion water bond enacted by the Legislature in 2009 was not voted upon in 2010. Bigelow said his family’s cattle business has been hit hard by the drought. With most of the herd now gone, employees who worked the cattle have been laid off. “We can’t tolerate any more crops being terminated,” he said. Berryhill complained that despite the drought, “The environmental community continues to put fish in front of people.” He said spring’s water management decisions aimed at protecting fish sent large amounts of water to the ocean rather than its beneficial uses. He cited recent polls that indicate the 2009 water bond of $11.14 billion has majority voter support. As for conservation, Stevenson said, “We can’t get much more efficient.” He said Harlan Ranch long ago adopted the most advanced modern irrigation techniques to save water. 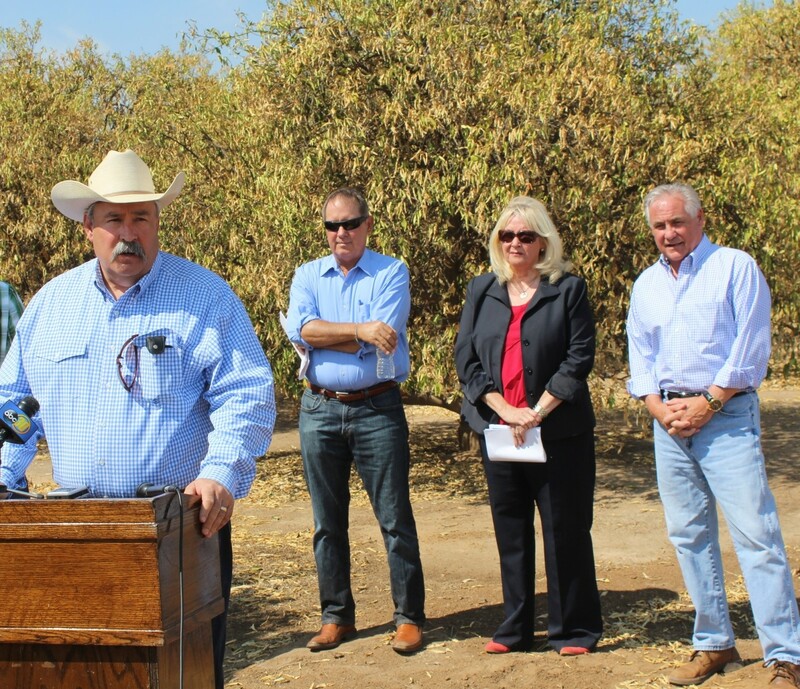 Against a backdrop of water-starved and soon to be pushed over orange trees, Assemblyman Frank Bigelow speaks to a Harlan Ranch news conference July 29. Listening (FROM LEFT) are Senator Tom Berryhill, Assembly Minority Leader Connie Conway and Assemblyman Jim Patterson.